Constructed from natural cream colored linen on a reclaimed oak wood frame. We love our ottoman! It's the perfect fit for a coffee table in our family room. It's elegant without being too formal, and yet it's great for having small kids around because of the soft edges. Great quality and great look! 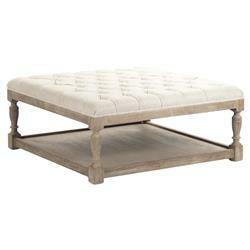 Enjoy the best of both worlds - form and function - with this tufted ottoman. Generous proportions and ample storage underneath make it a perfect piece for modern homes, while the pedestal legs and tufted linen surface up the style stakes.